S’mores are a basic campsite food. Many children and adults look forward to making s’mores while spending time outdoors. However, some people may tire of the traditional graham cracker, chocolate, marshmallow combination or they may want a new way to cook it. You can start by changing the ingredients. Graham crackers are standards for s’more. However, the other ingredients are easily changed. 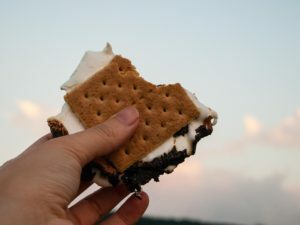 As for the marshmallow, there are several different flavors of marshmallow available on the market, any one of them would be perfect for a s’more. The chocolate can be changed from milk chocolate to dark or white chocolate. Each would give a different flavor to the s’more. But you don’t have to limit yourself to the traditional s’more ingredients. Why not add nuts or peanut butter to the s’more for a whole new flavor. On a white chocolate s’mores, you could add spreadable fruit or preserve. You can also use a different cooking method. Traditionally you would toast the marshmallow and sandwich it between the chocolate and graham cracker. However, not everyone is a fan of the marshmallow when it’s toasted or burned. Instead, why not put the fully assembled s’more in a foil packet. Place this packet over the open flame and let the s’more cook that way. This is similar to putting the s’more in the oven. This method warms up the graham cracker which will make it slightly softer if you don’t like dealing with the crumbs. If you really don’t like melted marshmallow, you can make a s’more using marshmallow crème. These have a different flavor, but it can be used for people who don’t want the traditional marshmallow flavor. By using these variations, you can make s’mores that fit the tastes of everyone in your camping party or group. You can try different varieties until you find your favorite.